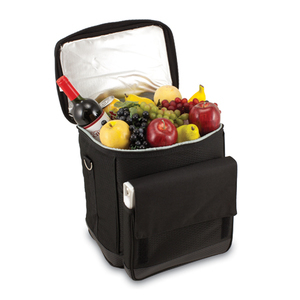 Picnic Plus Bailey 2 Person picnic set with our exclusive April Cornell print has a large insulated cooler section to hold over 16 cans. 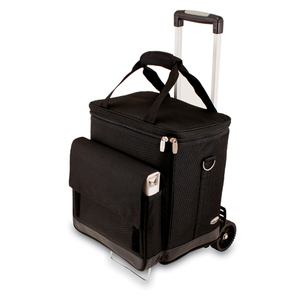 The fashionable 600D polyester exterior has a contemporary design. 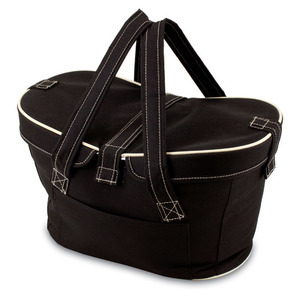 The large oversize carry handles and adjustable shoulder strap make this set very easy to transport to the beach, picnic, camping, and tailgating events. 2 side mesh pockets to hold water, drinks and accessories. Comes complete with a set of 2: acrylic drink tumblers, melamine plates, cotton napkins, stainless steel flatware, corkscrew bottle opener, easy to clean nylon cutting board and cheese knife.